WR WAFER CLASS 150-300 NPS 3"-24"
Wafer body, double eccentric disc, adjustable stuffing box, The PTFE seat is energized by the Inconel metal seat, anti-static device, fire safe, blow-out proof stem. 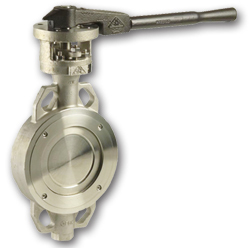 Butterfly valve of high performance with bidirectional seats for all the pressures range. PTFE seats with a core formed by a spring and a self-centring ring which give adaptability to changes of temperature and pressure. Internal wetted parts are according to NACE Standard MR0175.